We make hybrid Cloud a reality for the global Enterprise through secure direct Cloud connectivity leading to increased network performance predictability and reduced risk of cyber-attack. Our multiple connections around the world into AWS, Azure, Alibaba Cloud and others provide global connectivity into the most popular public Clouds all backed by end-to-end performance guarantees. Cloud platforms like Amazon Web Services, Microsoft Azure, Softlayer / IBM Cloud and Google offer agility, future-proofing and opex-based infrastructure. Yet many global enterprises remain concerned over Internet security and unreliable Internet performance. The CLOUD X® Fusion ecosystem puts your public Cloud platform securely and seamlessly into the heart of your network. And through our market-leading coverage, we can connect you into almost any Cloud Service Provider platform; anywhere. Your applications may be Cloud-based but that does not mean you always have to use the Internet to connect to them. With CLOUD X Fusion, you get guaranteed network performance when you connect to your Cloud applications using SLA-backed private MPLS, Ethernet or Hybrid WAN. Built on GCX’s vast private backbone network, CLOUD X Fusion makes Cloud applications perform more predictably and consistently than if they were connected to over the “best efforts” Internet – essential for application traffic transiting over long distances. Cloud traffic crossing the Internet is open to cyber-attack at any time, with incidents becoming increasingly sophisticated and frequent. By connecting to your Cloud Data Center to your network through CLOUD X Fusion you drastically reduce the risk of cyber-attack because Cloud traffic is transported on a private global backbone, and is therefore totally hidden from the public Internet. Some countries operate under strict regulatory control, or have stringent data protection laws governing where data can be hosted and transported to or from. More and more enterprises are looking at Software-Defined Networking and SD-WAN. CLOUD X Fusion is designed to work seamlessly with CLOUD X WAN, our own SD-WAN service. Integration of a Cloud platform into your CLOUD X WAN via CLOUD X Fusion is simple and seamless meaning you can take full advantage of the agility and future-proofing offered by SD-WAN without compromising on your Cloud application performance and cybersecurity. CLOUD X Fusion connects directly to a variety of Amazon Web Services Regions around the world through AWS Direct Connect. 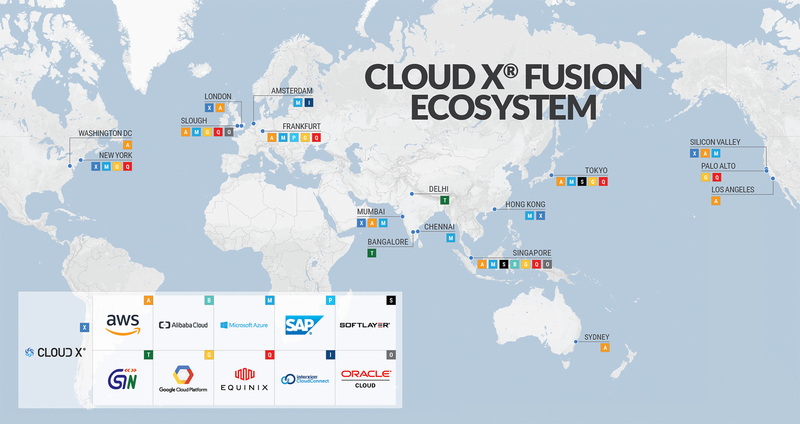 For details on CLOUD X Fusion connectivity into other Cloud Service Provider Platforms see our Global Coverage tab. CLOUD X Fusion connects directly to a variety of Microsoft Azure Regions around the world through Azure ExpressRoute. While any Azure platform can be reached directly through CLOUD X Fusion from the following locations with Azure ExpressRoute Premium.